Offer your Etsy customers discounts on merchandise or free shipping through coupons — or, more specifically, coupon codes. Buyers can then apply these codes to purchases during the checkout process. For example, you may offer a coupon to celebrate your store’s anniversary or an upcoming holiday, to reward repeat customers, or to share with your Facebook fans or Twitter followers. To spread the word about your coupon code, you can simply include the code in the packaging with any items you sell — say, by tucking a business card in with your piece. Alternatively, if you maintain a newsletter, you may want to include a coupon code there to drive sales in your Etsy shop. 1Go to Your Shop --> Shop Settings. 2Click the Coupon Codes option. You will find it in the left sidebar, under Promote. 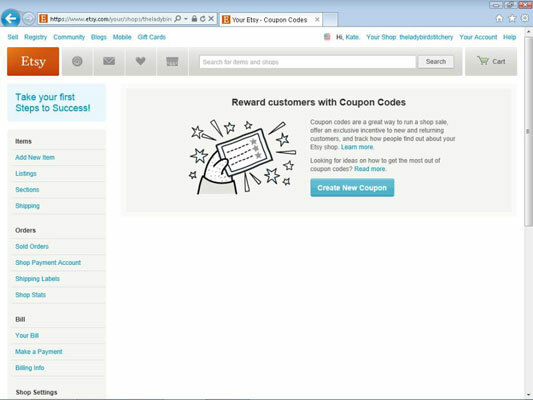 If you’ve never created a coupon before, you’ll see the Reward Customers with Coupons page. Otherwise, you’ll see the Coupon Codes page. 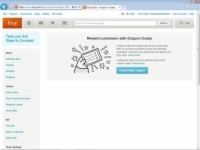 3Click the Create New Coupon button. 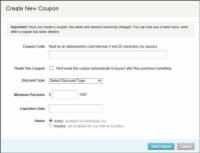 The Create New Coupon dialog box opens. 4In the Coupon Code field, type the code you want to use for the coupon. Note that this code must contain between 5 and 20 alphanumeric characters (no punctuation), with no spaces. 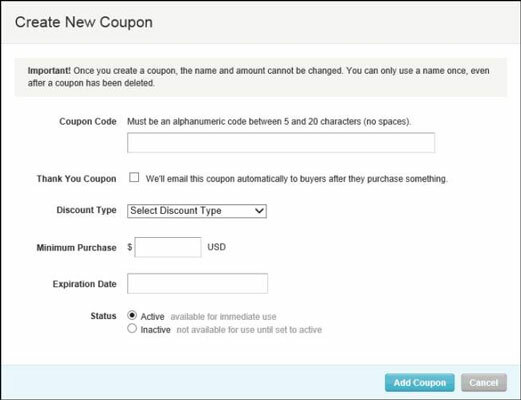 5If you want buyers to receive a coupon automatically upon purchasing an item from your shop, click the Thank You Coupon check box to select it. 6Click the Discount Type drop-down arrow and choose the type of discount you want to offer — Percent Discount or Free Shipping. If you choose Percent Discount, type the discount amount in the % Off field. If you choose Free Shipping, optionally check the Only for Domestic Shipping Addresses check box. When a customer redeems a coupon, Etsy’s 3.5 percent transaction fee applies to the discounted price. 7Optionally, enter a minimum purchase amount. You can also enter an expiration date, but it’s not necessary. Buyers must spend this amount to be able to apply the coupon. 8Click the Active option button to activate the coupon code. You’re almost ready to have some coupon action at your Etsy business. 9Click the Add Coupon button. Etsy creates the coupon code and lists it on the Coupon Codes page. 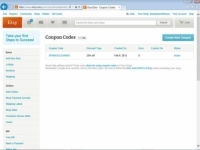 If you want to deactivate a coupon code you can easily do so. Simply click the code’s Active link. Then, in the dialog box that appears, click the Inactive option button and click Save Changes. Etsy deactivates the code for you. If you want, you can reactivate the code later by clicking the code’s Inactive link and clicking Active in the dialog box that appears. 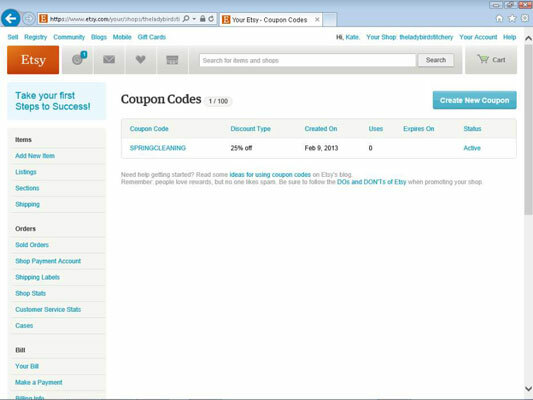 You can also simply delete a coupon code by clicking the X button to the right of the code in the Coupon Codes page.